Free Shipping Included! 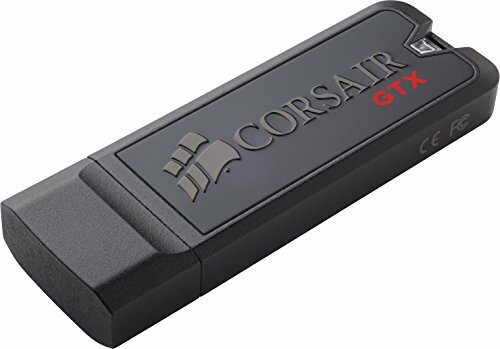 Corsair Flash Voyager GTX 256GB USB 3.0 Flash Drive by Corsair at Learning Delphi. MPN: CMFVYGTX3B-256GB. Hurry! Limited time offer. Offer valid only while supplies last. Most USB drives are fast. until it's time to copy a large file and you're looking at a progress bar that lingers around too long. The solution? Most USB drives are fast. until it's time to copy a large file and you're looking at a progress bar that lingers around too long. The solution? Integrate an SSD controller into a drive. Flash Voyager GTX gives you transfer speed that rivals your PC's solid-state drive. And, unlike some devices, Flash Voyager GTX delivers amazingly fast performance with large files, small files, and everything in between. It works with USB 2.0 and USB 3.0 ports on Windows, OS X and Linux systems, with no driver installation necessary. And, all this technology is contained in a premium zinc alloy body with aluminum accents and an integrated keyring.